Discussion in 'Guitars in General' started by Ides of March, Sep 8, 2008. Quality guitar or not, curious what the majority thinks. Overall, a very good guitar. It will get you some great LP tones for a reasonable price. However, you should try before you buy. I had a 95 LP Studio for over 10 years and it was a fantastic guitar. I have a 97 Studio that is fantastic. Rock, solid, sets up and plays great, and incredible tone out of it. It doesn't need to make any excuses for anything. Somebody is going to come along at any moment and say the pickups aren't great..but listen for yourself before you decide. I like the sound out of my Studio. My 95 studio is pretty much my go to guitar. I use it at most gigs and it has not failed me in 13 years. It's real solid and sounds great. I have a '92 Studio with a nice ebony fretboard......great LP. I have VM Studio that is a real killer in the tone and playability department. All the tone of a Black Beauty for five bills (I bought it used). The ultra-thin finish on it feels perfect to me and really lets the guitar breathe. What's not to love? 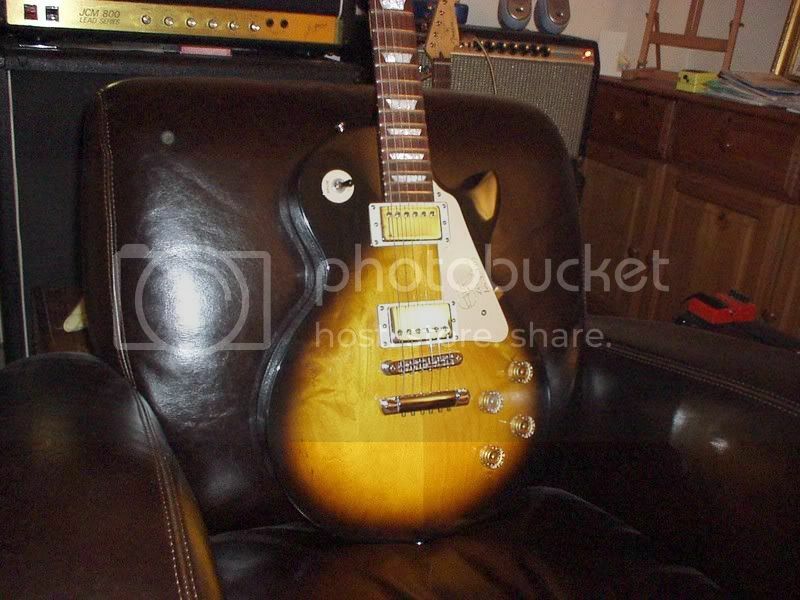 A friend of mine has an LP Studio SmartWood - absolutely lovely guitar. Build quality at least up with modern Standards. If I were in the market for a Les Paul, that's the first one I'd be thinking of. The tone is something else - all the b*lls of an LP, but with a top-end clarity and sparkle all its own. Gorgeous! I have had an Alpine White Studio for about a year and love it. I put an RS kit in it and replaced the nut with a bone nut. The Les Paul snobs may dis it, but the Studio is a Les Paul through and through. I DARE anyone to listen to a current Studio and Standard (if they're loaded with the same pickups) and hear ANY difference at all. Seriously. I have a Studio from 93, and it's an INCREDIBLE guitar. Just awesome. My Studio should be arriving here at any moment. I cant wait! Yep, personally, I like them quite a bit. I've seen other threads on the 490 and 498 where they got bashed a little though. Great guitars for the $, especially if you can find a Studio Standard from the mid 80s. The LP Studio is a fantastic guitar. The body is 1 and 3/4 inches thick compared to the standard or custom which is 2". I have '95 and the neck is pretty thick compared to a 60's slim neck. Well, I'm one of those who didn't like the 490-498 combo. I replaced them with Seth Lovers. Other than that, I don't think the guitar needs any modification per se and is a good buy, with or without the stock pups. Nice, I did not see this color in store. I have 2 - a '95 and a '00. They're great guitars. They're 100% stock and never gave me any trouble. I too like the 490/498 pickup combo. It's basically a LP Standard with no binding and different pickups. I'm not big into 'bursts & binding, so for the price difference, I'd rather have a Studio than a Standard. I had a '94-'95 in black w/gold hardware that I had no complaints about. I now have a Vintage Magohany that's sounds just like a Les Paul! Ive been playing mine all afternoon.